David Malin has obtained this beautiful image of M 66 with the 3.9-meter Anglo Australian Telescope. It is a composite of three images, taken with different emulsions and filters, thus sensitive for light of different colors, exposed as follows: Blue and Red: 27 minutes, Green: 22 minutes. 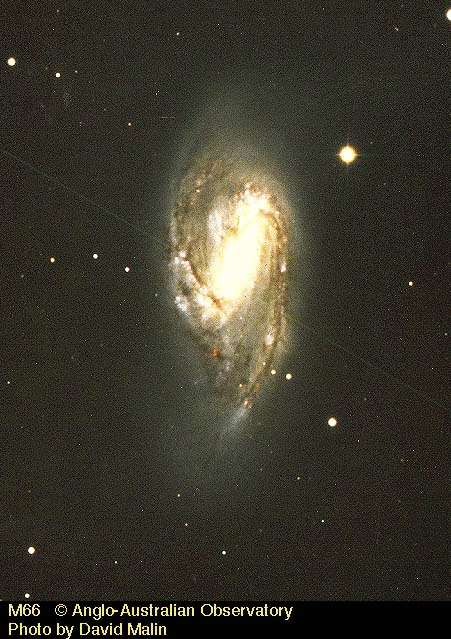 Messier 66 exhibits a remarkable central bulge. This galaxy shows several anomalies, deviations from "perfect" spiral structure, which can be observed in many galaxies, notably a crack in one of its spiral arms at the lower end of the bright central region and a wave-away of the spiral arm visible rightest in this image. This is very probably a result of its gravitational interactions with its neighbors M65 and NGC 3628. This images is copyrighted and may be used for private purpose only. For any other kind of use, including internet mirroring and storing on CD-ROM, please contact the Photo Permissions Department (photo at aaoepp.aao.gov.au) of the Anglo Australian Observatory.